In 2014, more than 5,000 school bus drivers in California participated in the One-Day National Survey of School Bus Red-light Runners. The participating school bus drivers reported 26,758 illegal passes for the day. In fact, the state of California leads the country in the number of vehicles that pass stopped school buses while children are loading and unloading the students. Tickets for failing to stop for a school bus under CVC 22454(a) are expensive. In fact, in the county of San Francisco, CA, the civil infraction for passing a school bus with flashing red signals comes with a fine of $616. California law prohibits passing a school bus when children are loading or unloading. When lights and signs are activated, all vehicles must stop. You should also be careful to obey the directions of school safety patrols or school crossing guards. For the crossing guard’s safety, allow him or her to get safely to the side of the road before driving ahead. Some school buses flash yellow lights when preparing to stop to let children off the bus. The yellow flashing lights warn you to slow down and prepare to stop. When the bus flashes red lights (located at the top front and back of the bus), you must stop from either direction until the children cross the street safely and the lights stop flashing. 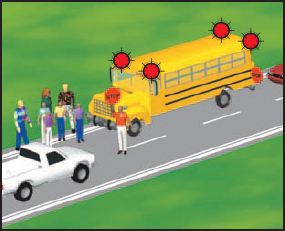 Under CVC 22454, California law requires you remain stopped as long as the red lights on the school bus are flashing. If you fail to stop, you may be fined up to $1,000 and your driving privilege could be suspended for 1 year. If the school bus is on the other side of a divided or multilane highway (two or more lanes in each direction), you do not need to stop.